Disfruta de estar en el agua durante las horas mágicas del crepúsculo. Compra otras bebidas del bar completo, si lo deseas. Encuentre su camino hacia el Royal Naval Dockyard para encontrarse con el catamarán de 50 pies (15 metros) que será el transporte de su noche. Suba a bordo y encuentre un lugar cómodo, ya sea en la cubierta, en la cabina o en la red estirada entre los cascos. A medida que el sol comienza a hundirse en el horizonte, escuche los comentarios de su guía sobre la cultura y la historia de las Bermudas, acompañados de música en vivo. Disfrute de un Swizzle de Ron, que se hace con granadina, jugos de cítricos y ron local y se considera la bebida nacional de las Bermudas. Una barra de efectivo completo también está disponible; Jugo de naranja, jugo de piña y agua son gratuitos. 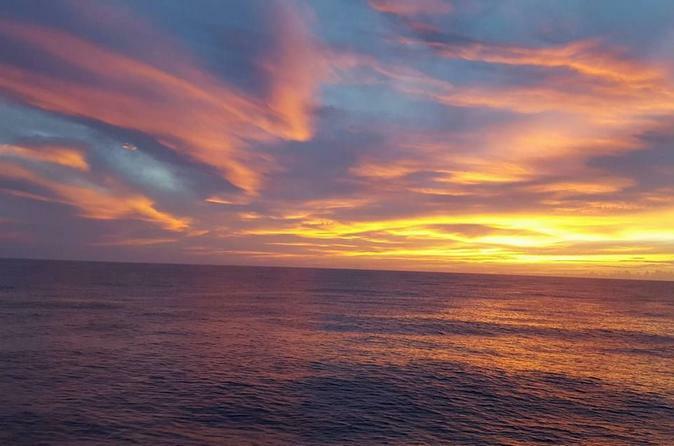 Sienta la brisa de la isla en su cara y vea la puesta de sol en otro día en el paraíso. Después de que el sol se hunda en el horizonte, el catamarán regresará al Royal Naval Dockyard. El crucero de 90 minutos terminará justo a tiempo para que usted vaya a cenar. Awesome time!!! Great friendly crew!!! The cost of the trip was extremely reasonable!!! We will definitely do it again next year!!! My husband, 4 year old daughter, and I had a great time with the Restless Native crew. The drinks were yummy and plentiful and our daughter loved the juice and fresh baked cookies. There wasn't really a sunset because of the overcast skies, but that wasn't their fault and we were just happy that the rain stopped before we left. We will definitely be booking again next year when we come back to Bermuda. Thanks! 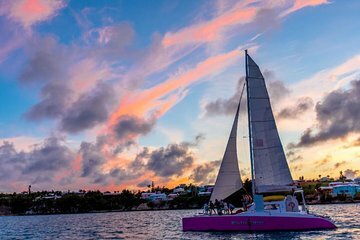 Although there wasn’t much of a sunset, by no fault of Restless Native, they ensured that we still had a beautiful catamaran boat cruise on the Bermudian waters! Endless rum punch, cookies and island history- perfect night out on the ocean. Thank you Restless Native! Incredible night on the catamaran. The sunset was great to see and the endless rum swizzles and Choc chip cookies were a HUGE hit. But when Dave brought out the saxaphone to play while the sun went down we all confirmed we were glad we picked this cruise. Xander was very informative and gave us a great history of Bermuda. Loved the ride and would DEFINATELY do it again!! thanks guys you rock! We had a great sunset cruise with a very informative guide. He told us all about Bermuda and answered all our questions! Great cruise staff was friendly and helpful. Me and my daughter loved the sunset cruise. Zander, Vanya, and Steve were amazing hosts. The sunset that evening was just ok, nothing spectacular, but the whole experience was so relaxing and enjoyable. Everything from the rum swizzles and freshly baked cookies to the funny and entertaining stories of the host Zander was nothing short of amazing. We would highly recommend it to anyone and would love to do it again, if we ever go back to Bermuda! It was one of the highlights of our trip for us! My husband and I really enjoyed this cruise. The staff was so friendly and informative and with a small group we felt like we had a private party. With the rum swizzles and fresh baked cookies all we needed was the sunset! Unfortunately, it was cloudy that night, but we still had a great time enjoying the lights of the cruise ships and of the town. I highly recommend this cruise. The crew was a lot of fun and knowledgeable about the Island. The Swizzle's were THE BEST! !